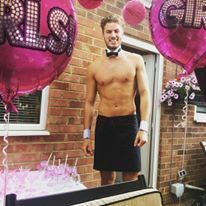 Our Beauty and the Buff Butler package has been designed for those hen or birthday parties that want to indulge in a spot of pampering, but with a cheeky twist! 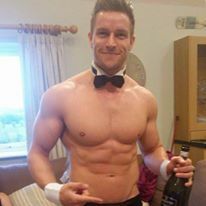 Luxuriate with a 30 minute treatment from our Bliss package whilst your very own semi-naked butler mixes you and the girls drinks, serves nibbles and plays party games whilst all he wears is a bow tie, collar, cuffs and a bottom-revealing apron! The duration of the butler can be reduced if it works better with your plans and will be priced accordingly. 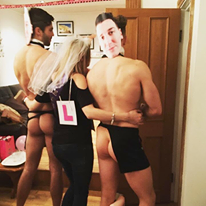 So whether you are looking for a fun idea for a 40th, or something to surprise the hen on her last night of Freedom, then get in touch to experience a pamper party with your very own butler in the buff. We will supply you with a cocktail menu of popular cocktails that your butler can make for you. You will need to provide your butler with any cocktail equipment such as a cocktail shakers, alcohol, mixers and trays! However, our butlers are great with their hands so they can improvise with any materials you already have at your venue!